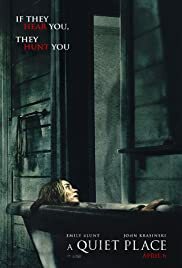 A QUIET PLACE is actor John Krasinki’s third directorial effort, a horror film that premiered at the South by Southwest film festival. Krasinski also co-write the script with Bryan Woods and Scott Beck based on their story. His first two films (THE HOLLARS, BREIF INTERVIEWS WITH HIDEOUS MEN) were, to put it mildly, nothing to write home about . A QUIET PLACE also stars Krasinki’s wife, Emily Blunt, which is a clear signal to stay away. But DON’T. A QUIET PLACE is his assured directorial piece that would put many horror directors to shame. It is scary, suspenseful and even had the audience (at the promo I attended) cheering at the end. These are signs of a good horror film, and the film has been getting rave reviews since its premiere. The poster looks like David Cronenberg’s RABID. A woman, bloodied lies in a bath tub. The scene occurs in the middle of the film when Evelyn (Blunt) has to deliver a new born in silence while the monster attracted to sound lurks around the house. The script concentrates on scary set-ups but omits details and history of the setting. Nothing is mentioned on how the situation came about. What brought about the destruction of the human race? Where did these supposedly deaf creatures come from? What is the reason the Abbott family is the only one that survived? But one can argue that if the film works in its aim at scaring, no one should question these omissions in plot. As Hitchcock as proven in many of his films, the same holds true in A QUIET PLACE. The placement of an expecting mother having to give birth in silence for fear of monsters attracted to noise is nothing short of brilliant. The delivery scene kept the audience at the edge of their seats, evident as I looked around the theatre during the segment. A word of warning! This film requires a very silent audience, so pick a seat away from others. The screening I attended had a person bring his own snacks, and one could hear him crackling his packages open and cans of pop. Really annoying. The theatre should ban popcorn and snacks for the screening of this film. The special effects and sound are impressive. The monster with its big ears and dripping saliva moving around to the sound of a creaking door is sufficiently menacing. It is well to note that Millicent Simmonds (Todd Hayne’s WONDERSTRUCK) who plays Regan the deaf daughter is deaf in real life. Krasinksi did not want a non-deaf actress pretending to be deaf. Most important is the fact that a deaf actress would help his knowledge and understanding of the situations tenfold. Simmonds who communicates in American Sign Language in the film to avoid sound taught the actors ASL during the filming. The authenticity comes through in the film. A QUIET PLACE achieves what it aims at, a solid horror film with a message of strong family values that ends up satisfying entertainment for all.